Sliding fence gates have a great look to them, and for larger spans, open faster and in a more compact space than a swing gate. DuraGates is the latest development in sliding/rolling fence gate technology that has rendered sliding gates maintenance-free when using DuraGates hardware! Benefits of using DuraGates Hardware! With the weight of the gate transferred to the ground, gate openings up to 59 feet with a weight of 4000 pounds can be accommodated. Enclosed track system helps comply with ASTM F2200 & UL325 safety standards. This system is perfect for snowy, icy, rainy…. basically any environment as the rollers are enclosed inside the track and are not affected by precipitation thus eliminating the need for constant cleaning and maintenance. 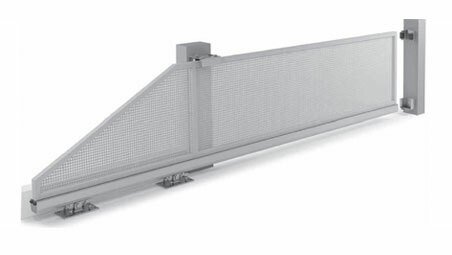 The gate can be either welded or mechanically attached to the bottom track. The counterbalance is less than traditional cantilever hardware which works especially well when space is restricted. Once the 2 carriages are mounted on the concrete pad, simply slide the gate on the carriages and add the end wheels. High quality rollers and track result in years of troublefree operation. The gate will roll smoothly and can even be operated with one hand. This reduces the load on the gate motor resulting in a longer life and reduced maintenance on the motor. Enclosed, sealed bearing equipped roller construction, no lubrication required! The sealed bearings really stand up to dusty environments where grit would eat up non-sealed bearing designs. Since no unsightly wires or overhead track are needed with DuraGates, our hardware makes for a more aesthetically pleasing gate system. It can also be adapted for a gate with an arched top. No track on the ground to trip over. The driveway can be uneven and sloping since the gate is off the ground. Nice slide action if there is nothing in the way of the rollers like a garden hose, rock, or other obstruction. Needs digging of trench along length of driveway for proper installation. Ground track can be obstructed by objects laying over it. Rollers can possibly be derailed. In freezing weather, snow and ice can obstruct the track, and when the gate is open, the track would potentially be in the way of snow plowing. In freezing weather the rollers can freeze up, compromising the smooth slide action of the gate. Sometimes a closed roller system, meaning the rollers are sheltered from the elements within the track, this way snow and ice doesn’t impede the rolling action of the gate. Bearings used in these systems are not commonly a sealed bearing, so maintenance is required, grease must be used to keep the bearings within the trucks rolling smoothly. This type of lubrication accumulates grit, especially in dusty environments and requires a cleaning of the track and roller surfaces to maintain a smooth gate action. Overhead systems usually do not work with gates that are meant to be ornamental or even just aesthetic, the track looks quite industrial from the outside if it is not hidden by the gate. It is not possible to do an arched top gate. Gate is constantly pulling down on the track resulting in limited weight capacity. Economical: Because this type of system uses the bottom pipe of the chainlink gate as a track, there is no track to purchase. This means that all you have to buy are rollers to support and guide the gate. These gates have practically no aesthetic appeal, this is why they are commonly used in industrial applications. Due to using the chainlink panel frames as the channel for the rollers, the gate itself can get quite dirty from lubrication of the rollers getting onto the gate frame. These gates can have the least smooth action. The rollers are exposed and need constant cleaning. As the gate posts may eventually shift, the rollers may need constant adjustment.